As mentioned in earlier U.S. sales reports, Audi has been expecting to break an all-time sales record in America this year. As of Monday night, Audi of America reports that the company has sold 93,507 vehicles in 2010; a new all-time U.S. sales record. While this news is plenty to celebrate in its own right, today's report notes that - for the first time in company history - Audi is on pace to sell over 100,000 vehicles in America this year. HERNDON, Va., Dec 14, 2010 - Audi broke its annual vehicle sales record in the U.S. Monday evening when it recorded its 93,507th transaction of 2010. The sale eclipsed the old U.S. record of 93,506 vehicles sold in 2007. 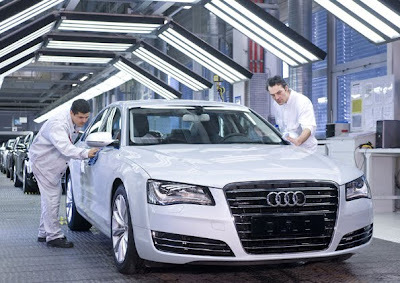 Mark Del Rosso, Chief Operating Officer, Audi of America said there is no question that the brand will exceed 100,000 2010 vehicle sales by the end of December and that it will aim for another record-breaking year in 2011. The U.S. will be the fourth market for Audi globally with sales exceeding 100,000 vehicles, joining China, Germany and the United Kingdom.